Description: Bright sky, so-so photo, for the record. Old B&O signal in the forground. Description: CSX 5314 is the trailing unit on 18G. Description: With the sky bluer than the ocean 18G creeps up to the signal at CP-Bethlehem on its way east to Oak Island. Description: Never seen this alstom sd40 before. Pretty good catch as they blow n/b thru 69th street yard. Description: CSX 5314 quietly slips in to Hamlet. These new GEVO's are so quiet compared to the old fashioned brute power screaming out of the following SD40-2. 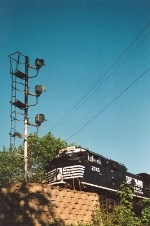 Description: An array of power sits at the west end of the West Springfield Yard. Description: CSX 7880, CSX 5314 and CSX 593 idle in West Springfield. Description: Eastbound Q108 crosses 34th St. Description: EB approaching the viaduct. Description: Two ES44DC's lead a SB intermodal train at WAY.